Weber Tools is your partner for tools and industrial equipment. The webshop of Weber Tools shows our extensive range of abrasives and 5,000 further articles. The comprehensive product range from Weber Tools. Our coated abrasives are manufactured in glue, resin, waterproof and special bonds to meet the demands of every application. Our performance products are available in the full range of forms and sizes to suit all applications and make sanding cost effective on a wide range of materials. 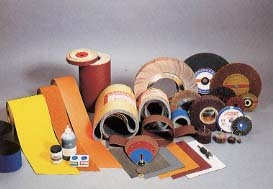 The available forms are: sheets, drum covers, strips, rolls, belts, cylinders, cones, discs and flap wheels.